Astrophotographer Miguel Claro took the image from São Miguel Island in the Azores on April 5, 2014. The Milky Way galaxy arcs across the night sky in this magnificent view from the Azores, a chain of nine volcanic islands near Portugal in the Atlantic Ocean. 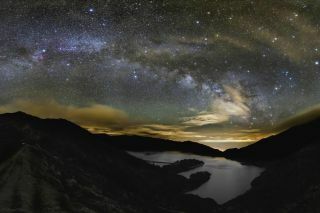 Astrophotographer Miguel Claro of Lisbon took the image from São Miguel Island in the Azores on April 5. Claro used a Canon 60Da – ISO2500; 24mm at f/2 with an exposure of 20 seconds to create this 21-image mosaic.